LYMI | What Does LYMI Mean? LYMI means "Love You, Mean It". 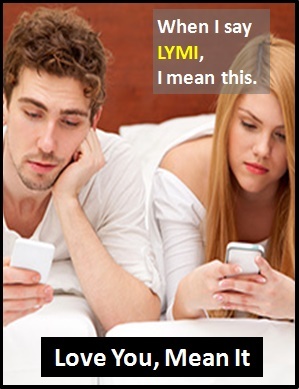 The abbreviation LYMI is commonly seen as a flip, insincere way of signing off a conversation. Although it is a shortened form of the sentence "I love you and I mean it", which could be construed as heartfelt, it is generally taken to indicate a less sincere sentiment. "Love You, Mean It" can also be abbreviated as LUMI. To avoid confusion when expressing true love, it is probably best to use an abbreviation such as ILU (I Love You), rather than LYMI. LYMI doesn't always mean that you mean it. Shona: Are you still angry with me? Sammy: No, see you later. LYMI. Gill: I've posted the parcel for you. Wendy: Thanks so much for doing that. LYMI. As it is pronounced using its individual letters (i.e., "El Why Em Eye"), LYMI is classified as an initialism abbreviation. Initialisms are different to acronyms, which are spoken like words. Before the digital era, we might have said something like "Lots of love" or "Love you, bye" instead of using LYMI.